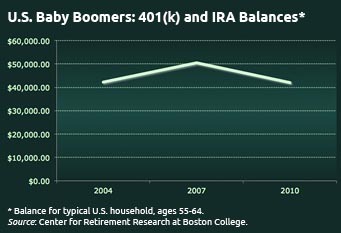 Baby boomers’ balances in 401k and IRA accounts have barely budged for most of the past decade. In 2004, the typical U.S. household between ages 55 and 64 held just over $45,000 in their tax-exempt retirement plans. Plan balances for people who fell in that age group in 2007 rose but settled back down after the biggest financial crisis in U.S. history. In 2010, they were $42,000, a few bucks lower than 2004 balances. These are among the reams of sobering data contained in the Federal Reserve’s 2010 Survey of Consumer Finances released in June. The $42,000 average balance is for all Americans – it includes the more than half of U.S. workers who do not participate in an employer-sponsored savings program. There’s more bad news buried in the SCF: the value of other financial assets such as bank savings accounts dropped in half, to $18,000. And hardship withdrawals from 401(k)s have increased, to more than 2 percent of plan participants, from 1.5 percent in 2004. So, where did all that wealth created by the longest economic boom in U.S. history go? The 2008 financial collapse didn’t help. But we can also blame the baby boom culture. Click here to read a year-ago article that examines the cultural reasons for the troubling condition of our retirement system.